For the first Tony's Chocolonely collaboration of the year, I was thrilled to be able to work with Ryan Fox and Ben Hjelm at Nomad to spread the word about slave-free chocolate. 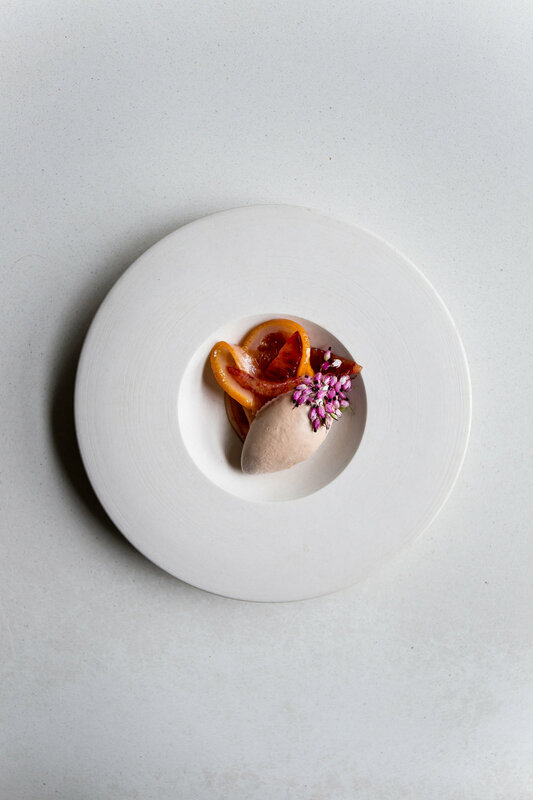 Ryan and Ben used Tony's dark chocolate to create a lavender-infused ice cream that they paired with poached and fresh blood oranges and topped with a sprinkling of heather flowers. For the month of February, Nomad will be offering the dessert on their tasting menu at the chef's counter, as well as à la carte in the bar. Tony's also will be giving away small dark chocolate bars to all guests because there's no such thing as too much chocolate. To help bring attention to the mission of Tony's Chocolonely, we threw a small gathering with friends to celebrate the new dessert. Human slavery in the cocoa industry is an ongoing problem, yet many people remain unaware of, despite the ubiquity of chocolate. The fact that the cocoa industry in east Africa is so reliant upon forced labor, often of children, is hard to reckon with the amount of pleasure so many people get from chocolate. Tony's is not only committed to shining a light on the issue for consumers, but also in changing the industry as a whole. If you're not in the Portland area to check out this incredible dessert from Nomad, then definitely give it a try. The recipe at the end of the post, and if you're inspired to keep baking with slave-free chocolate, find the full list of Not Just Dessert recipes here. Enjoy and stay tuned for more! Whisk together the egg yolk and sugar, set aside. 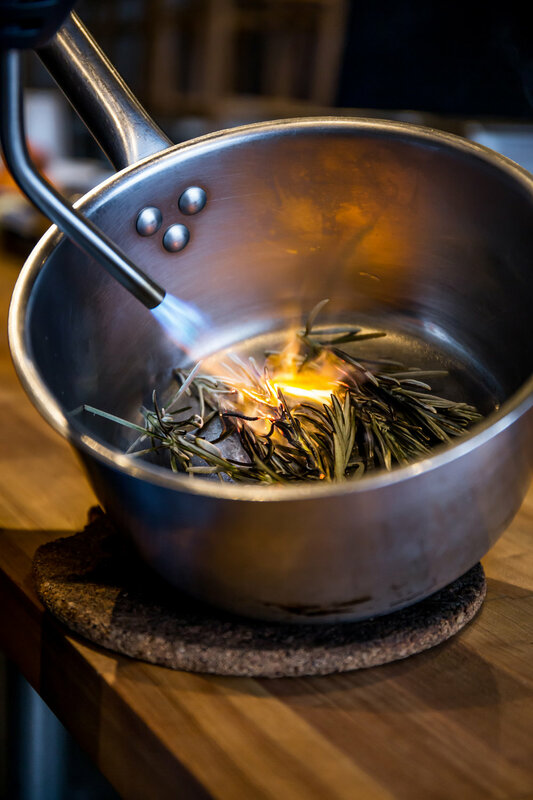 With a kitchen torch, burn the lavender until it starts to smolder, about 30 seconds. Place in a small pot together with the cream and milk. Heat until 170°F. Remove from heat, then temper in egg and sugar mixture. Strain over the chopped chocolate and then mix until chocolate is fully incorporated. Cover and refrigerate until cooled, at least 1 hour, but preferably overnight. Transfer the mixture to an ice cream maker and spin according to the instructions. Mix together the sugar and water in a small pot over a low heat. Add the blood orange slices and cook gently in the syrup for 1.5 hours. Cool and serve next to the ice cream with additional segments of fresh blood orange. Christmas is almost here! It will be quite a different year with all my siblings traveling elsewhere, but my little family will celebrate with my parents and - truth be told - I think we're all looking forward to a quieter celebration. I've probably been a little too relaxed about it because I haven't wrapped any gifts, sent family cards, or even finished most of my shopping. But we went to see The Nutcracker yesterday and have baked dozens of cookies while listening to Christmas carols. More cookies are in the works, of the chocolate variety. I'm thrilled to be partnering with Tony's Chocolonely on a series of collaborative recipes inspired by their delicious, 100% slave-free chocolate. 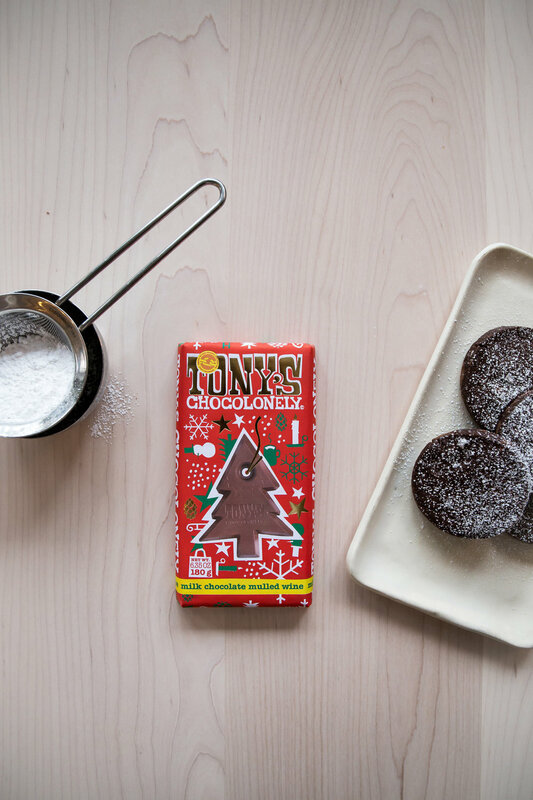 The first collaboration is with Nora Antene, the pastry chef at Tusk in Portland, who created Christmas Spice Chocolate Shortbread Cookies with Tony's limited edition mulled wine milk chocolate bar. The cookies are on the Tusk dessert menu now through December 24. Guests who dine at the restaurant on Christmas Eve will receive a special gift from Tusk and Tony's. If you're inspired to keep baking with slave-free chocolate, I also recommend chocolate mousse or semolina chocolate chunk fritters from our Valentine's Day series. Find the full list of Not Just Dessert recipes here. Stay tuned for a new recipe coming in January and wishing everyone happy holidays! Cream butter, sugars, salt, and vanilla. In a separate bowl, whisk together dry ingredients and slowly add to creamed butter. Mix in chocolate pieces until combined. Roll dough between two pieces of parchment paper to ¼ inch thick. Chill until firm, about 20 minutes. 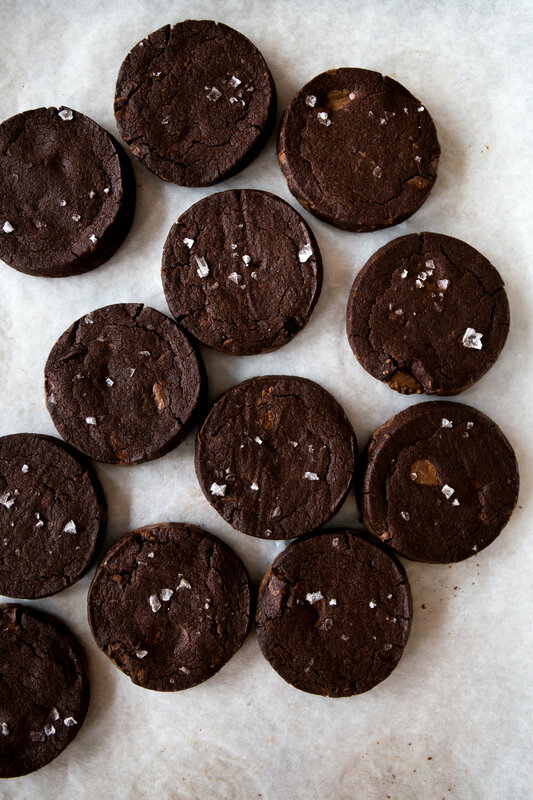 Cut into circles or favorite holiday shape, and sprinkle with fleur du sel. Bake at 350°F for about 8 minutes or just until the cookies puff and crack. The cookies will be very soft, but will firm up after cooling. Enjoy! Today I had my last photo shoot of 2017. A wild and wonderful year that brought along new clients, amazing partnership, and plenty of challenges. I still have a few loose ends to wrap up, photos to edit, and administrative tasks to check off, but I'm going to go ahead and declare myself officially on holiday. For what it's worth, being a small business owner. Over the next two weeks, I plan to read books, bake holiday favorites, watch movies, spend time with my family, and sleep as much as possible. We have plans for two performances, a trip to the mountains, and glasses of egg nog ad infinitum. Egg nog: one of the holiday staples that is as divisive as it is delicious. Some detest it, some adore it. Some take it only with a generous helping of booze or mixed with milk, some insist on maintaining it in its purest form. Throwing things into even wilder territory is this non-traditional take that I worked on with the amazing Colleen Jeffers, which brings in pistachio milk, aquavit, and egg white. It's iconoclastic, for sure. 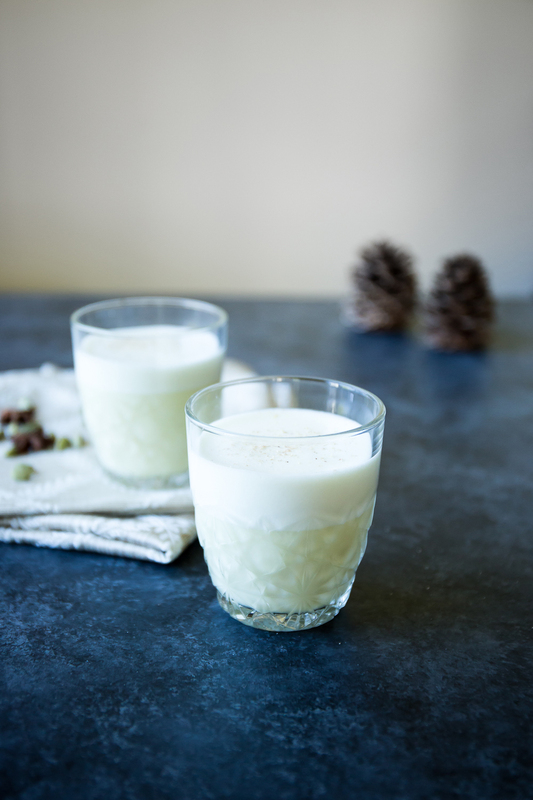 But also delicious and with just enough milky, nutty smoothness and warm spices to make it a perfect holiday drink. Enjoy! Shake with ice, serve with freshly grated nutmeg on top. Cover the pistachios with 2 inches of water and soak overnight at room temperature. Drain pistachios and add to a high speed blender. Add hot water and blend on high for 1 minute. Carefully pour blended nuts through a cheesecloth-lined sieve or nut milk bag. Squeeze out remaining liquid (ground pistachios can be reserved for another use, like muffins or smoothies).Cool completely, then transfer to a bottle or container and store in the refrigerator for up to one week. Note: Leftover pistachio milk can be enjoyed on its own or with a touch of maple syrup, cardamom, and rose water stirred in. This post was created in partnership with The Wonderful Co. Thanks for reading and cheers! Hello December! I'm welcoming the new month with open arms. I love the holidays and all the festive celebrations, sparkling lights, family time, and food that the month brings. Cookies are at the very top of that list. And these Wonderful Pistachio flour sugar cookies are the best I've had ever. Yes, I called it. Best Christmas cookie ever. The kind you'll want to bring to every gathering and give to everyone you know. Tomorrow morning, I’m headed off to Chicago with a tin of these cookies packed in my carry-on suitcase. It will be a three-day whirlwind of visiting family, eating as much as possible, and trying not to freeze, with a photo shoot at the newest Stumptown Coffee in the middle of it all. It has been years since I’ve been to Chicago, the city where my father was born and raised, and I'm excited to be there again, pistachio cookies in hand. There is a delicious simplicity to sugar cookies, but the addition of pistachio flour gives them a nutty complexity that plays well with vanilla icing. But these are actually delicious without frosting as well. Trust me, I ate my fill during this summertime photo shoot that pulled out all the holiday stops. Working with The Wonderful Company these past couple of years has been amazing. They are a dream client in so many ways, and I love how they always encourage me to make favorites even just a little healthier. I've sung praises of ivory wheat flour before and it doesn't disappoint in this recipe. We made a sugar cookie delicious enough to eat without frosting, but also experimented with using healthier toppings with icing instead of sugar-packed, often artificially flavored and colored sprinkles. Our favorites were dried fruit (cranberries, cherries, apricots, currants), dried flowers (lavender buds and rose petals) and, of course, pistachios chopped in varying degrees of coarseness. Now, off to make another batch before zipping up my suitcase. You'll find the recipe at the end of the post, enjoy! To make pistachio meal, put the shelled pistachios in a food processor. Pulse pistachios until the texture of coarse sand then set aside. In a medium bowl, mix ivory wheat flour, unbleached all-purpose flour, pistachio meal (flour), baking powder, and sea salt. In a mixer, cream butter and sugar until smooth. Then add vanilla and eggs to the wet mixture and beat until fluffy. Mix in dry ingredients on low speed until fully incorporated. On two separate sheets of plastic wrap, scrape out the dough. Divide in two and wrap in the plastic. Pat dough into one inch discs. Chill dough for at least three hours and up to two days. Heat oven to 350°F. Line baking sheets with parchment paper. Working with one disc at a time, roll dough on a floured surface until about ¼ inch thick. Cut out shapes with cookie cutters and place on baking sheets about two inches apart. Repeat process, chilling dough in between cookie batches. Bake cookies 7-9 minutes until golden brown on the edges. Cool cookies completely on a rack before you start frosting them. In a small bowl, combine the milk and confectioner’s sugar. Mix until smooth. Scoop into a squeeze bottle or piping bag, then outline the cookie with icing about ¼” from the edge of the cookie. Once the lining is dried, fill the rest of the cookie with frosting. 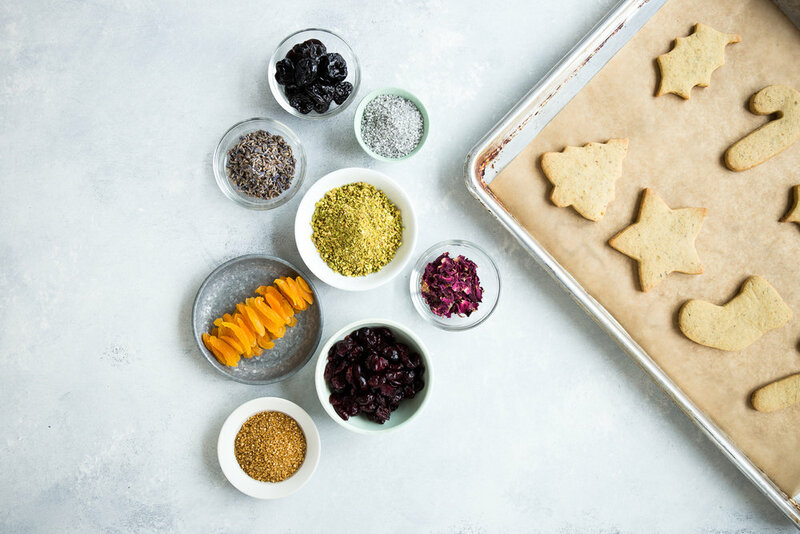 Decorate the cookies with icing, chopped and ground pistachios, dried fruit, or dried flowers or just enjoy them frosting free! This post was created in partnership with The Wonderful Co. Thanks for reading! Whenever people ask me how I got into food photography, I often talk about traveling abroad, experiencing other food cultures, and attempting to recreate the flavors of my childhood when home felt far away. With a camera always by my side, food became the natural subject for my photos. Or I mention my start in journalism, how I loved creating things for people to enjoy and - hopefully - inspire or inform them in some small way. And how that love for creating led me to capturing others who create with a fierce passion, in the world of food. However, that story omits one of the subtle, but key influences: my sister Brenna. She started to fall in love with food at about the same time, inspired by her incredible garden and courses at cooking school. Even though we lived on opposite sides of the world, we talked frequently. Not daily, but pretty close. She was usually making breakfast in Portland at about the same time I returned from work in Amsterdam and began making dinner. We'd both be cooking 'together' via Skype. She shared her expertise and recipes with me, as well as book and cookbook suggestions. Her knowledge grew quickly and today she knows a LOT about food: how to create it, expand on flavors, make ingredients look amazing, and feed the masses without breaking a sweat. I, on the other hand, have learned a lot about how to photograph food and appreciate those who have mastered the art of creating it. After returning to Portland and ever-so-slowly building my photography business, more opportunities arose where we could collaborate, each of us bringing our separate, but complementary talents to the table. We work together with that flowing ease of people who have known each other 100% of their life (or 95.37% in her case). It's easy. We know what we have to do and we communicate without reserve and with a huge dose of love. Plus, Brenna is queen of the playlists on set of a photo shoot. Looking for more excuses to bring our talents together, we decided during a project this summer to get together once a month to work on something just for fun. 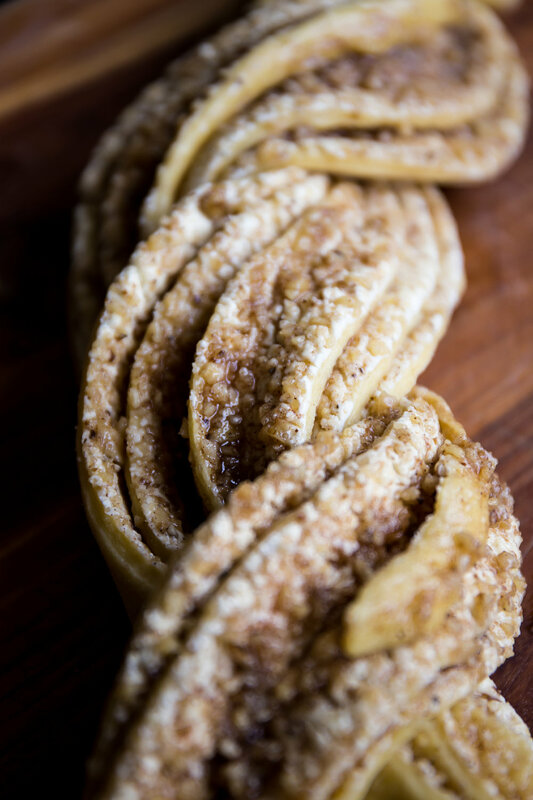 These walnut maple rolls are the result of the first collaboration. I wanted to work on something sweet. I love pastries of any kind, always. Brenna had the idea for rolls that were kind of similar to a holiday wreath bread she makes every Christmas morning. The dough would have looked great in a wreath-like circle or twisted, but we liked how the rolling and twisting of the dough created a layered pastry, rather than a straight-up roll. 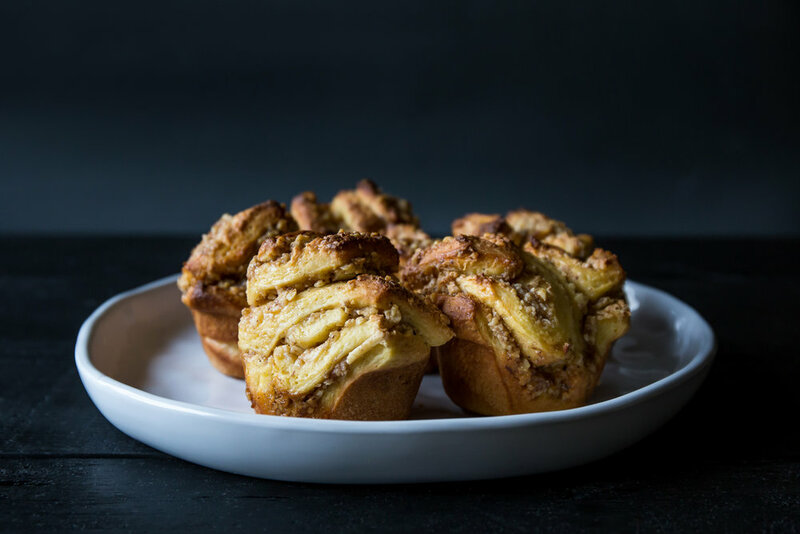 An extra drizzle of maple syrup once the rolls have cooled, and these make for the perfect breakfast roll. You can find the recipe at the end of the post. Enjoy! Warm milk and butter in small pan on low heat. Once the butter is melted, remove from heat. Let cool slightly. Then whisk eggs and maple syrup into butter and milk mixture. In the bowl for kitchen mixer, mix all dry ingredients together. Using the dough hook, slowly add the wet ingredients to the dry ingredients while mixing until it comes together as a dough. Let the dough sit for 10 minutes. Turn the dough out onto a floured board and knead bread. Sprinkle with additional flour if dough becomes sticky. Keep kneading for five or more minutes until the dough is smooth and bounces back. Put dough in oiled bowl and cover with plastic wrap until dough doubles in size (approx. an hour or so). In a food processor, add the walnuts, cardamom, cinnamon, vanilla, maple syrup, and sugar. Pulse until walnuts are finely chopped. Add maple syrup and mix well. Put mixture in a small bowl and set aside. Add additional flour to board and turn out the risen dough onto the board. Then roll out dough into a 10x12 rectangle. Spread the room temperature cream cheese onto the rolled out dough to the edge. Spread the walnut and maple syrup mixture over the cream cheese and then tightly roll up the dough starting from the longer side. Roll out the rolled up dough until it’s 3-4 inches longer then slice down the center of the dough from end to end. Wrap the two sliced dough around each other with the layered interior facing up multiple times until completed wrapped around each other. Slice the twisted dough into 10-12 slices. Grease a muffin pan with butter, including the edges. Place each sliced roll in the muffin tin with sliced side up then cover with oiled plastic wrap. Let it rise for 35 minutes in a warm area. Preheat oven to 400°. Bake rolls for 10 minutes and then turn down oven to 350° for another 10-15 minutes or until the rolls are golden brown. After the rolls have cooled slightly, remove them from the muffin tin. Brush the rolls with maple syrup and enjoy! Last weekend, we turned our clocks back for daylight savings and the dark evenings have put me in hibernation mode. We had two glorious weeks of sunshine, blue skies, crisp air, and colorful leaves swirling on the ground at the end of October. And then November came, along with the rain and darkness, and suddenly it feels like we're on the fast track to winter. Cue the oven for endless baking and roasting. These roasted red peppers remind me of a summer I spent in Rome. One of my roommates made stuffed mushrooms, and then later a variation with peppers. They were incredible. Vibrant and flavorful, and - maybe most impressive - whipped together with the random ingredients we had on hand. I love watching people cook like that, their imagination lighting up as they peek into the corners of a cupboard. A little of this, a little of that. Et voilà, no shopping trip required. The same can be true for stuffed vegetables, a mix and match game tailored to the season. I love the vibrancy that red peppers add to the table, but a stuffed winter squash would be a delicious alternative. Topped with a generous handful of parmesan and Wonderful Pistachios, naturally. What are your favorite hibernation activities? In addition to spending more time in the kitchen, I've been reading a lot more the past month. I just finished This is How You Lose Her, both by Junot Díaz, and recently re-read The Brief Wonderous Life of Oscar Wao, also by Díaz and Isabel Allende's Island Beneath the Sea. Let me know if you have any recommendations! Preheat oven to 425°F. While oven is heating, cut the red peppers in half through the steam and remove the seeds. Brush all the cut peppers with olive oil and sprinkle with salt. Bake red peppers cut side down for 7-10 minutes until cooked through. Flip over peppers cut side up and set aside. Turn oven heat down to 375°F. While the peppers roast, cut the potatoes into a small dice. In a medium pan, sauté zucchini and onions in olive oil on medium-low until the onions are translucent then add the minced garlic. Cook for another 1-2 min. Sprinkle with salt and set aside in a bowl. Sauté potatoes in pan with olive oil and salt. Make sure to let the potatoes sit for a few minutes so that one of the sides gets golden in color. Stir potatoes and finish cooking them completely. Sauté mushrooms in olive oil until golden on both sides. (Make sure the mushrooms are spread out so they have room to release water and crisp up). Toss mushrooms with a sprinkle of salt and parsley. Finally, sauté kale in a little olive oil and salt until just barely cooked through. Mix zucchini, onions, potatoes, mushrooms, and kale together in bowl. Add in chopped pistachios and Parmesan to the bowl. Mix well then salt and pepper to taste. Fill the peppers. Sprinkle with pistachios, breadcrumbs, parsley, and more Parmesan (if needed). Bake peppers until heated through for about 4-7 minutes. Remove from oven and enjoy! This post was created in partnership with The Wonderful Co. Thank you for reading! 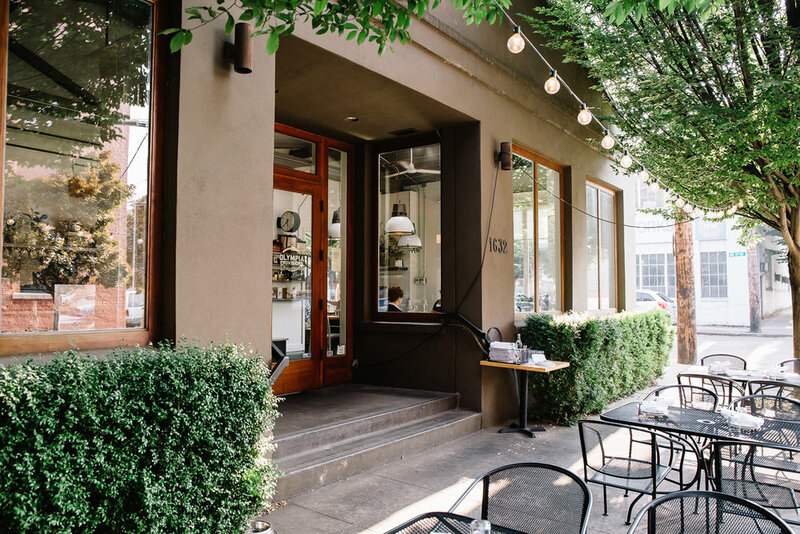 BreakfastClub is returning to Portland with collaboration breakfasts with three amazing chefs. And I'm excited to be partnering with BreakfastClub to give away a pair of tickets to each! To enter, just pop on over to this Instagram post! 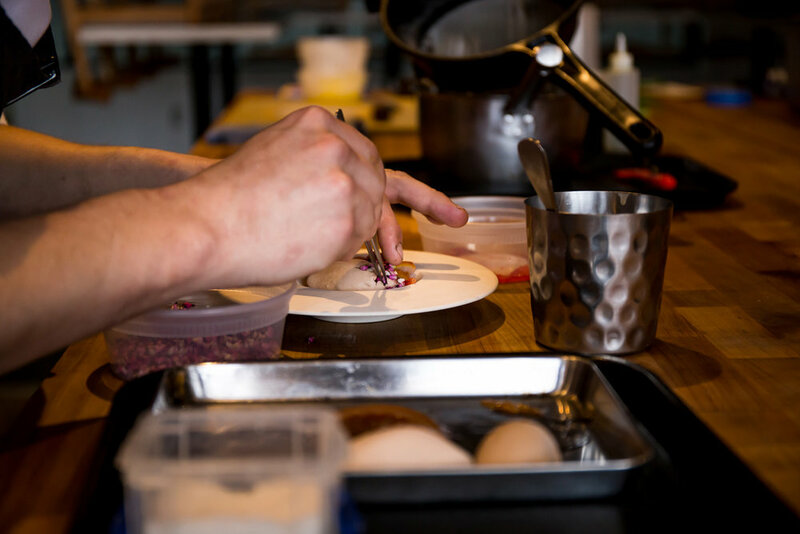 The global event series aims to connect culinary and design innovators through the ritual of breakfast. Last June, founder Emily Elyse Miller of Trends on Trends brought BreakfastClub to Portland, one of 20 BreakfastClubs held around the world. The sumptuous sit-down breakfast was a private event held at Olympia Provisions, with an amazing spread including the Eggs Benedict pictured above. Now, BreakfastClub is returning with a new approach: more chef talent, open to the public, and a challenge to the chefs to turn their dream breakfast into fast food. Guests are invited to stay, eat, and meet new people, or simply grab and go. Each breakfast include a main, two sides, coffee or tea, and a super secret prize. BreakfastClub fast-food style has been to New York, Austin, and Miami so far and is on its way to LA, followed by Portland and San Francisco. Tickets can be purchased here or you can try your luck entering via Instagram! Contest terms: No purchase necessary. Void where prohibited by law. Contest begins 10/26/2017 and closes 10/28/2017 at 10pm PST. All entrants must have a public profile, must be following @carly.e.diaz and @trendsontrends_ , and leave a comment and tag a friend. One entrant per event will be selected at random. The winners will be contacted to organize the prize. If the winner does not claim the prize with 24 hours, another winner will be selected. This promotion is in no way sponsored, endorsed, or administered by or associated with Instagram. Bottom two photos by Trends on Trends. The weather has turned and autumn is in full swing here in Portland. The quiet ache for just a few more warm days reminded me of the Chobani dinner that I had the opportunity to photograph in August. The heat was thick in the air, laced with a humidity that we don't often get in the Northwest. Even the Chobani team from New York seemed impressed with the temperatures. And that pink cocktail? Not only pretty, but so delicious. Such a wonderful evening and a blast working with the Chobani team. Now, time to get in the kitchen and try to recreate the taste of summer with these dishes. Summer is passing so quickly! We've been doing our best to squeeze the most out of the season, even though it's been unusually hectic. I actually created this post on the trip home from Amsterdam yesterday, where we spent some time after visiting Marcus' family in Berlin. In between all the things, I've been enjoying as many summer activities as possible with my little family: swimming, picking berries, roasting marshmallows, going to the county fair, and our trip to Europe. Even though it's been a whirlwind, I feel like we've made the most of the summer. Summer is also a busy season for my photography work, and tends to bring many of my favorite projects. I was reminded of this in July as I drove out to a photo shoot at Brooks Winery. It was a warm, blue-skied day, perfect for a visit to wine country with one of my favorite clients. 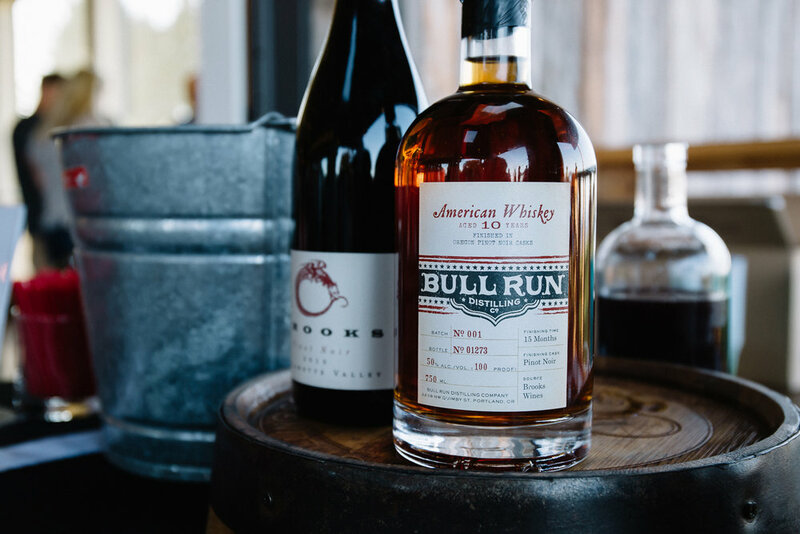 Bull Run Distillery recently released a version of their American Whiskey finished in Oregon Pinot Noir Casks from Brooks Winery, which they were showcasing in two seasonal cocktails for a summer wine club party. 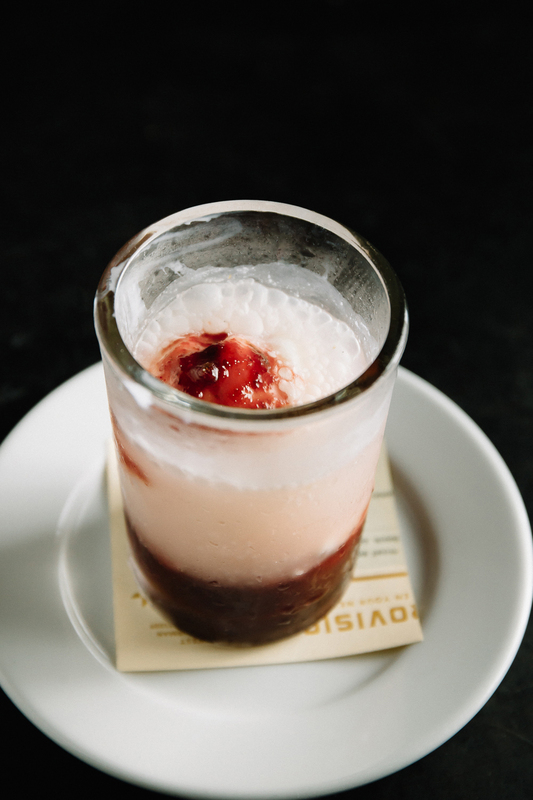 The Northwest Sangria Punch, created by the amazing Jennifer Kadell, was rich and fresh, packed with the sweetness of ripe August cherries and garnished with fuzzy young mint from the winery's biodynamic garden. Add whiskey, pinot noir, black cherry juice, and raw honey simple syrup to a cocktail shaker with ice. Shake vigorously and pour into a rocks glass filled with ice. Top with seltzer and garnish with young mint. Enjoy! Earlier this month, we moved to a new home in West Portland. It was a quality of life inspired move with the added bonus of central air and a much shorter commute for Marcus. We are excited for this next phase of life and what it holds for our family. But, man, moving is rough. I won't bore you with the whiny details, but this month has been intense. After all my travels, I should be accustomed to packing my things up and settling into a new place without a lot of fuss. You'd think. Over the years I've come to realize that, as much as I loved adventure and exploration, I also need home and familiarity. I have recreated that in all the places I've lived around the world, but it always takes time. One of the signs of settling in has always been the moment I get to turn on the oven and bake. There is something about popping something delicious in the oven that christens a new house and starts the process of making it a home. When I was invited to join the #summerlovespeaches party with my favorite peach recipe, I knew it would be a galette, one of my favorite ways to showcase seasonal fruit. And nothing says summer like peaches. Fragrant and fuzzy, with juice dripping down your arm and splattering on the ground style peaches. I always love the added crunch of nuts and pistachio are an obvious favorite. The smoked caramel sauce adds a campfire vibe that is so fitting. Mix flours, salt, and sugar in a food processor. Slowly add the butter, pulsing until it resembles small peas. Slowly add the ice water, pulsing until it the dough just begins to come together. Transfer the dough to a lightly floured surface. Form two even-sized circles without over-kneading the dough. Cover in plastic and place in the refrigerate for at least one hour. Meanwhile, make the filling. Slice the peaches and place in a large mixing bowl. Add sugar, cornstarch, and lemon juice and mix until peaches are thoroughly covered. Let sit for about 20 minutes. 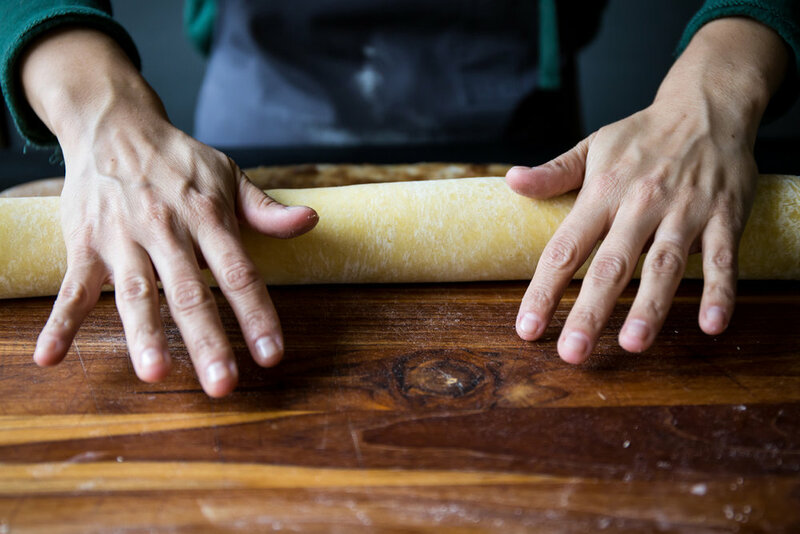 When dough has cooled, remove from the refrigerator, take off the plastic and roll out on a lightly-floured surface until just under ¼ inch thick. Place the filling in the center, allowing to spread slightly. Sprinkle with pistachios then gently fold over the edges of the dough and brush with egg white. Place on a baking sheet lined with parchment paper. Bake at 375 degrees F until the crust is golden brown, about 30 minutes. Let cool then drizzle with smoked caramel sauce and extra pistachios. Be sure to check out #summerlovespeaches on Instagram for the other great recipes! 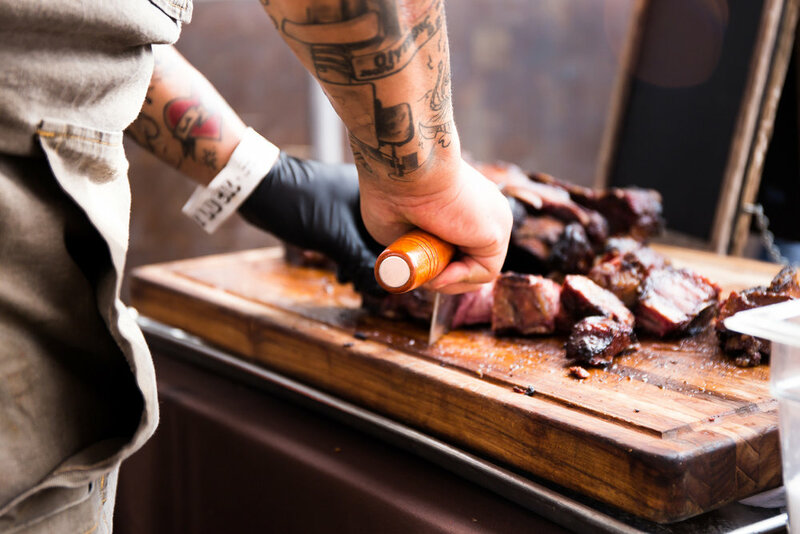 In the mid-May, I had the opportunity to photograph at Hot Luck, the new food and drink festival in Austin, Texas put on by the team behind Feast Portland. To say it was epic is an understatement. It had many of the telltale signs of Feast: high caliber chefs and sponsors, impeccably organized details, and water bottles at every turn. Yet, it had its own distinct voice and felt undeniably Texan. The festival began with Hi, How Are You, a gathering at Franklin Barbecue to kick off the festival. Highlights included Roy Choi's Korean-BBQ fusion bowl, Peter Cho's Traeger-grilled blood sausages, and Sara Kramer's smoked sweet potato with Moroccan black olives, labneh, and trout roe. And the Underwood Frosé, the perfect antidote for the muggy weather. I'd heard about Franklin's famous bbq, but had never tried it before. That evening gave me my first taste, and I was even invited into the smokeroom (see the black and white photo below), which was incredible and even warmer than I could imagine. I'm surprised my camera didn't melt. Day Two of Hot Luck brought festivities at East Austin's Fair Market, a larger event that still maintained a backyard-gathering vibe. There was more meat, not only the daintily composed bites, but also gnawing-at-the-bone portions. It was a meat fest, to be sure. My favorite spot was the Underwood and Stumptown pavilion with unicorn floaties for lounging and steel barrels with cans of wine and cold brew floating around on flamingo cupholders. It was fun and a great spot for relaxing when the evening started to wind down. It was an awesome group of photographers at Hot Luck, 5 of us in total, including my dear friend Sarah Natsumi Moore. It was such a pleasure to photograph alongside Sarah, an incredible artist in so many respects. We met years ago in Amsterdam and have been peer mentoring each other in our businesses (and life) for a couple of years now. She is such an inspiration and I loved watching her work and seeing the way she captured the same atmosphere in her own unique style. It took the festival to a whole new level for me. More to come on Day 3 and 4 of Hot Luck! In April, I had the opportunity to work with Portland Sangria on a summer campaign for their wine spritz collection. I used the brand colors and the ingredients as the inspiration for the shoot and went for a fun, airy feel to complement the season and the fresh produce. Portland Sangria originally started with a rosé wine sangria with raspberries, loganberries, and cardamom. Since then, they've added a white wine sangria with blueberries and basil, and a white wine sangria with lemon, ginger, and rosemary. 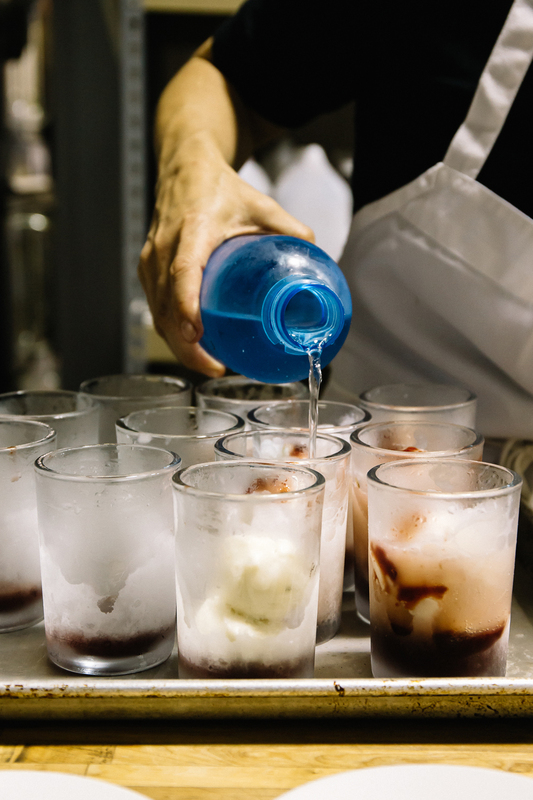 The fantastic Katie Burnett of Bull in China created several cocktails with the sangria, creating moments for action shots of pouring, bubbling, and fizzing. Even though the weather in Portland has been persistently cold and grey for most of the month, I've been loving how Portland Sangria infuses a bit of summertime into even the darkest of days. They are dangerously sippable and, although I've heard from many that the blueberry-basil sangria is a favorite, I love the subtle gingery bite of the lemon-ginger-rosemary sangria. Here are a few of my favorite images from the photo shoot! Salads seem like the perfect food to me. You can keep it simple or go all out, packed with protein and grains, or vegetable forward and light. I love the variety of textures - a crispy carrot here, a squishy tomato there. The crunchiness of seeds contrasting with the creaminess of cheese. And the endless possibilities of vinaigrette. Before this begins to sound like a love song for a salad, I'll admit that I don't get past the simple greens-onion-tomato-olive oil-balsamic-salt-pepper version as often as I'd like. There are some incredible restaurants in Portland taking salads to the next level. But in my own kitchen, salads seem like an afterthought and I wish they took center stage more often. A recent project gave me the perfect opportunity to improve my salad game, resulting in this salad that showcases the radishes and spring greens of the season, while grasping at the last days of citrus season. The tangy sweetness of mandarin is the ideal complement to the cumin-flavored shrimp. A genius call by my sister, Brenna, with whom I worked to create this recipe for a client. This is the kind of salad that only asks for a crispy piece of bread with butter and a glass of chilled white wine. My idea of a perfect meal. In a medium bowl mix, prepare ingredients for marinated shrimp. Mix the olive oil, cumin, garlic, and salt. Then add the shrimp and toss well. Cover with plastic wrap and put in the refrigerator for 1 hour. Mix the ingredients for the lemon vinaigrette. Season to taste and set aside. Tear the leaves off the butter lettuce leaving them whole. Wash them well and set aside to dry. Slice the radishes in half then two more times to create small wedges. Set aside. Prepare the green onions and set aside. Cut the mandarin orange slices in half and set aside. Take the butter lettuce leaves and place them in a bowl. Drizzle half of the lemon dressing over the leaves. Then sprinkle the sliced almonds over the leaves. Add the radishes, mandarin oranges, and green onions. Add the feta cheese and remaining lemon dressing. Season to taste. Toss radishes with olive oil and salt. Using a grill pan, lightly grill radishes. Set aside. Using the same grill pan, grill the shrimp on each side for 3-4 minutes until done. Season with salt to taste. Then add the radishes and shrimp to the prepared salad. Enjoy! Over the last three months, I had the opportunity to work with Alma Chocolate to capture their incredible array of small-batch chocolates, bonbons, caramels, drinking chocolate, and baked goods and the team at work hand crafting each piece. It was exactly the kind of project I love, which allowed me to photograph the creative process, finished project, and the passion in the details. The first two sessions took place at their shop on SE 7th. The café setting looks over the open kitchen where visitors can watch sweets being covered, molded, dusted, and more. The third session was at their shop on NE 28th, which also offers their line of chocolates, in addition to fresh baked goods, like their epic chocolate cake, cookies, and macaroons. Pretty much my idea of heaven. This walnut and stilton soda bread, with a glass of my favorite whiskey. The Homegoing by Yaa Gyasi, I finished reading it last week and absolutely loved it. 10 Healing Turmeric Recipes, much needed as I battle yet another cold. Chalino is now open! Johnny Leach brings inauthentic Mexican food to N Williams. I'm in. Flink's gorgeous wool accessories has me ready to book my next holiday to Amsterdam. Finally got my hands on Small Victories and already love the Kimchi Fried Rice, Apple and Toasted Oat Muffins, and Spring Herb soup. The anijs latte at Prince Coffee in Kenton. So delish. A photograph never stands alone. Beautiful. 12 meals for the winter weary, that'd be me. In November, I had the opportunity to observe the incredible Thomas Story, the in-house photographer for Sunset magazine, at work on set. More to come on that later, but during the photo shoot we had the chance to indulge in a delicious treat of hazelnut goodness that I haven't been able to forget. This recipe is my attempt not to recreate, but to capture a small essence of that day. 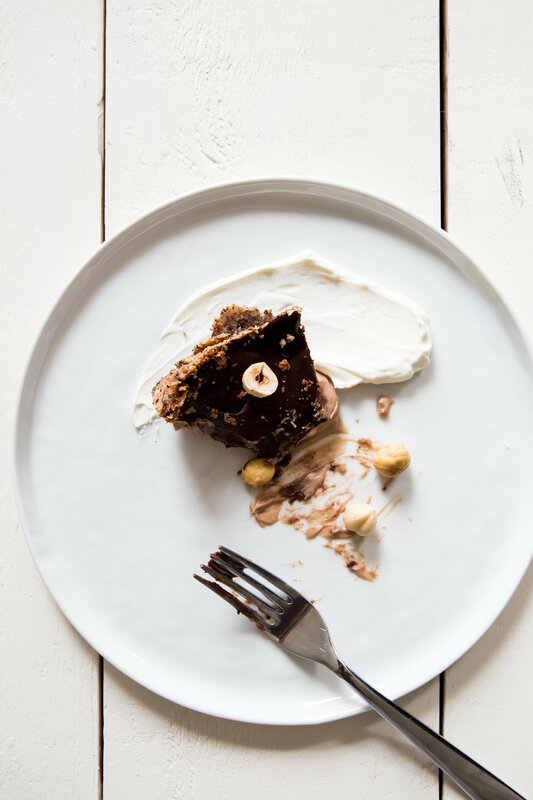 A cream pie is just what is needed in March, one of those months that feels so transitional and the seasonal offerings are a little meager. Here in the Pacific Northwest, we are slowly shrugging off the winter, and spring is offering teasing glances of its much-anticipated arrival. It was a long winter, indeed, but the end is in sight. A little decadence then, shall we? 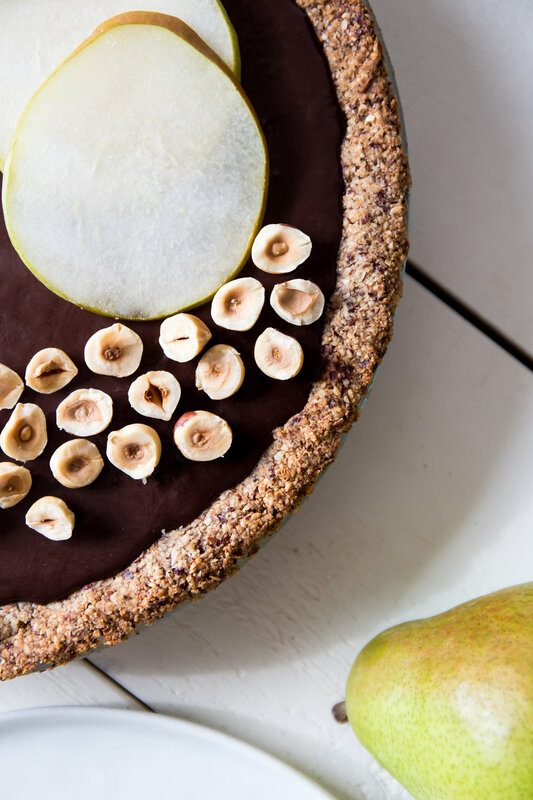 This pie brings together some of my favorite dessert components. Cream and chocolate, hazelnuts and pears. A heavenly quartet. The reserves of the autumn pear harvest are dwindling, but I find the pears essential to balance the sweetness. 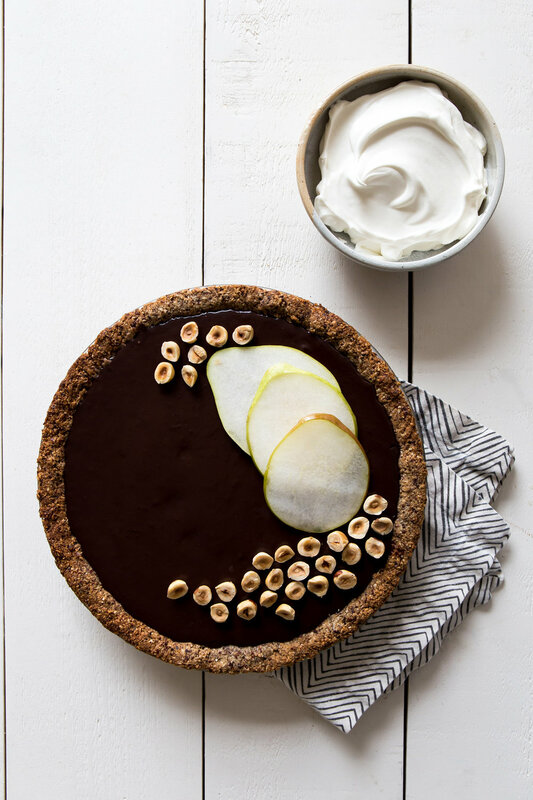 Poaching the pears in ginger creates a sharpening effect on the layers of cream and chocolate, and a generous sprinkling of hazelnuts to finish each slice adds a wonderful crunchy texture in every bite. Using a hazelnut flour crust deepens the hazelnut flavor throughout, but a traditional shortcrust pastry also would be delicious. Peel and core the pears with a small knife. In a medium pot, combine the pears, sugar, cinnamon stick, ginger, and 6 cups water. Bring to a boil then reduce heat to low. Cover and simmer until the pears are tender, about 15 minutes. Transfer the pears to a large bowl, reserving the liquid. Heat the pear liquid to boiling. Cook, uncovered, until the syrup is reduced to about 3 cups, about 15 minutes. Gently pour liquid over the pears. Cover and refrigerate until well chilled, at least 4 hours, turning the pears occasionally. When the pears are chilled, remove them from the syrup and place on a towel and gently dry. Cut into thin slices. To make the hazelnut pie crust, heat oven to 350°F. mix the hazelnut flour, salt, and brown sugar in a medium bowl. Add egg whites and mix until thoroughly blended. Butter an 8- to 10-inch pie plate. Line the edges and bottom of the pan with the crust mixture, pressing and squeezing the mix firmly into place until even. Use the bottom of a measuring cup to create an even surface. Line crust with aluminum foil and fill with pie weights. Blind bake in the oven for 10-15 minutes, then remove foil and pie weights and bake for an additional 10-15 minutes until crust is golden brown. In a medium bowl, mix cream cheese, chocolate hazelnut spread, powdered sugar, and vanilla. Beat until smooth. In another bowl, beat the whipping cream and the sugar until stiff peaks form. Fold whipped cream into the cream cheese mixture until smooth and a consistent color. In a small saucepan, warm the cream for the ganache. When cream begins to just simmer, remove from heat and add the bittersweet chocolate. Let sit for several minutes and then mix until smooth. When the pie crust has cooled completely, create a thin layer with the pears. Next, spoon hazelnut cream mixture until it reaches about ½ inch from the top. Pour the chocolate ganache and smooth with a icing spatula. Top with pears and toasted hazelnuts and chill for at least an hour. Serve with a dollop of cream and a generous sprinkling of hazelnuts. Enjoy! A few months ago, I began asking for the dessert menu along with the food menu when I dine at restaurants. It all began after several instances where, when the meal finally turned to my favorite course, I simply couldn't take another bite. Or, when the dessert of my choice simply clashed with or was too similar to the other food I'd eaten. Making selections based on an understanding of the meal as a whole makes more sense with my approach to eating. Or maybe I just have a serious sweet tooth. I recently learned that Americans consume approximately 2.8 billion pounds of chocolate each year and that 58 million pounds of chocolate are purchased in the week of Valentine's Day. That's incredible, even by my standards. Mousse is one of those perfect desserts for anytime - decadent, but airy. 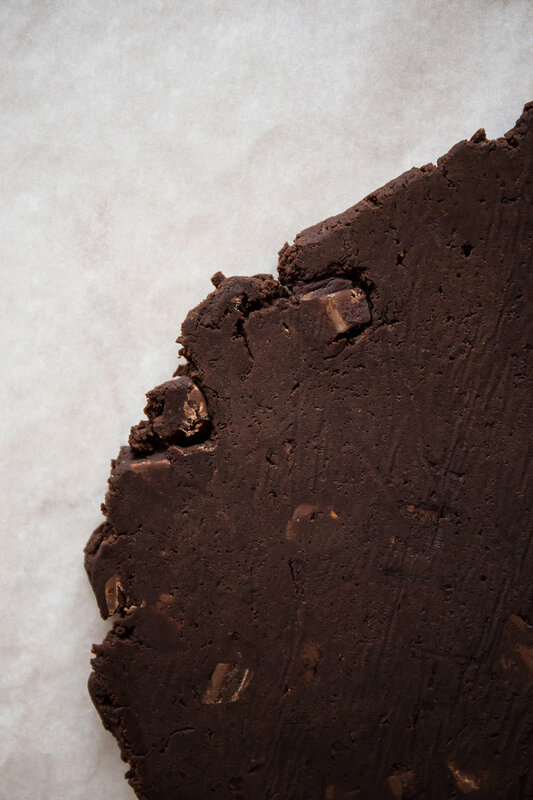 When Kristen Murray of Måurice, the sweetest luncheonette in downtown Portland, proposed to make chocolate mousse for a project celebrating Tony's Chocolonely and slave-free chocolate, I couldn't wait to see what she came up with. Mixing dark and milk chocolate, Kristen created a mousse with a rich, creamy texture, topped with beet-poached lady apples, tempered chocolate with wild rose petals, and a generous dollop of whipped cream. Simply divine. When I realized just how much chocolate is being consumed each year, I understood more clearly that the source of chocolate is just as important as how delicious it is. Because when someone puts as much effort into planning their eating choices and dessert selection as much as I do, there isn't much reason not to include ethical sourcing in the list of priorities. For the month of February, I've partnered with Tony's and two of Portland's fantastic pastry chefs to bring you not only recipes, but the opportunity to taste desserts made with 100% slave-free chocolate at two restaurants in town. Don't miss the recipe with Nora's semolina chocolate chunk fritters. If you're in Portland, you can taste Kristen's chocolate mousse all month long at Måurice and at home with the recipe below. Find the full list of Not Just Dessert recipes here. Heat oven to 325 F. Spread cocoa nib on a baking sheet in a single layer and cook for 10 minutes. Remove, let cool slightly, then crush in a mortar and pestle. Slowly warm cream in pot on stove. Add toasted cocoa nibs to cream and let infuse for 20 minutes. Refrigerate cream and cocoa nibs for at least 24 hours. Combine dark and milk chocolate in a double boiler. Place the bowl over a small pot filled halfway with water over medium heat, making sure the bowl does not touch the water. When the chocolate begin to melt, stir until smooth. Transfer to a large mixing bowl and set aside. Place the egg yolks in the bowl of an electric mixer with the whisk attachment. Beat on the low setting while slowly adding in 75g of sugar. In a small pot, add the remaining 175g sugar and 25-35 g water. Measuring with a candy thermometer, heat sugar and water to 250 Fahrenheit. Then slowly add to the egg yolk and sugar mixture in the electric mixer. Whip till viscous with a pale yellow appearance and cool to the touch. Fold egg and sugar mixture into the chocolate mixture in three small batches. Add a pinch of sea salt. Gently fold in whipped cocoa nib cream in three small batches. Place in small serving cups layered with whipped cream and toppings of your choice. Grab a spoon. Enjoy! 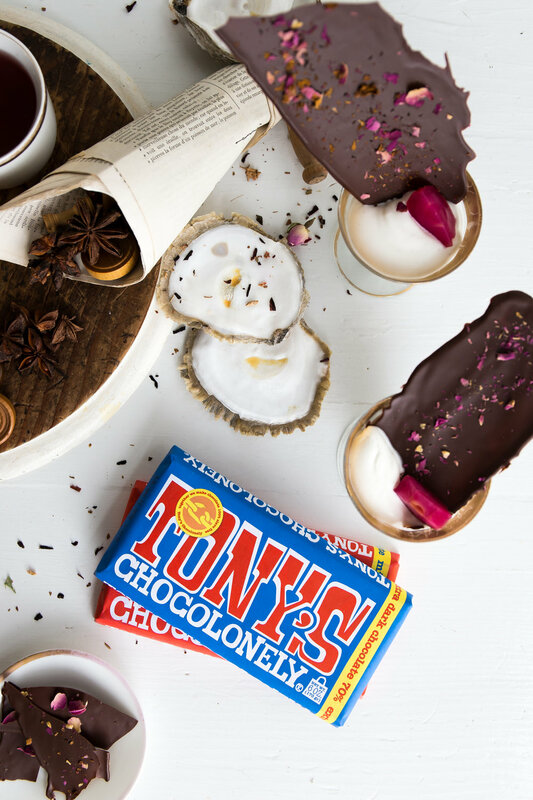 This post was written in partnership with the wonderful team at Tony's Chocolonely, an amazing crew of people who make me seriously miss Dutch-style lunches, karnemelk and all. Thoughts and opinions are, as ever, my own. A few weeks ago, as I was preparing for the post-inauguration Women's March in Portland, I was uncertain which words to paint on the sign I would carry. There were so many things to say, so many issues I wanted to address, and not enough posterboard for them all. And now, in the following weeks, there is a similar sense of being intimidated by the numerous actions to take and causes to support. And this is on top of all the other issues around the globe that deserve attention. While there is only a finite amount of time and money that I can give towards the causes that I care most about, I also have to remind myself that there are so many small actions I can take every day. And one of those actions is eating chocolate for a good cause. Easy, right? 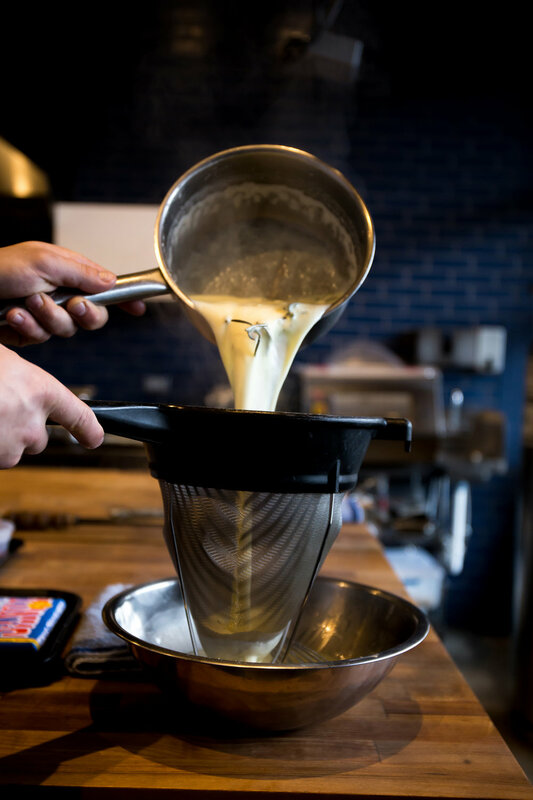 Even easier when it's chunks of Tony's Chocolonely that have been incorporated into semolina fritters created by the incredible Nora Antene, Pastry Chef at Tusk. And for the month of February, they are on the Tusk brunch menu for you to enjoy. Or to make at home with the recipe below. Find the full list of Not Just Dessert recipes here. Tony's Chocolonely. The name brings back memories of Amsterdam. Of rusty bicycles and endless canals, of shopping at the ubiquitous grocery store Albert Heijn, and of Sinterklaas, the holiday on December 5th on which chocolate letters are gifted to children and friends. And Tony's was the chocolate of choice. It was from Tony's Chocolonely that I first learned about a little known issue: that the cocoa industry is heavily reliant on slaves. And that many of the slaves are children. Sixty percent of all cocoa comes from Ivory Coast and Ghana where 2,300,000 children work on cocoa plantations. Dangerous working conditions and illegal trafficking of both adults and children compounds the problem. Tony's is working to change that and its 100% slave-free chocolate is not just an ethical choice, it's a delicious one as well. The chocolate is really good. And inventive too. I had the opportunity to visit the Tony's world headquarters and test kitchen on my summer trip to Amsterdam and was so impressed. Most memorable was a milk chocolate 'popcorn discodip' flavor. Like a popcorn party in your mouth. Tony's Chocolonely opened their second office in Portland in autumn 2015 to share their delicious slave-free chocolate with the Pacific Northwest and the US at large. For the month of February, I've partnered with Tony's and two of Portland's fantastic pastry chefs to bring you not only recipes, but the opportunity to taste the creations at two restaurants in town. If you're in Portland, you can taste Nora's semolina chocolate chunk fritters all month long during Tusk's weekend brunch. Stay tuned next week for the second recipe! In a small pot, heat a few inches of vegetable oil to 350 F. Carefully scoop golf ball size fritters a few at a time into the fry pot. Fry for about 2 minutes flipping the fritters halfway through. Drain on paper towels and, when cooled slightly, dust with powdered sugar. These are great on their own or served with orange curd, caramel, or chocolate sauce. Batter can be made ahead of time. Refrigerate after leaving at room temp for an hour. Bring back to room temp before frying. ** As the batter sits, the baking powder is activated and the mixture becomes airy. Avoid stirring so that the mixture keeps its lofty structure. Waking up today, I couldn't be happier to be starting the month of February. Not only because it is unofficially the month of chocolate, but because January was a wild one. Political upheaval, an epic snowstorm here in Portland, and a general sense of things being off kilter. Not the usual refreshing start to the new year. Even the ordinary, everyday tasks come under scrutiny. What is the use of food photography at a time like this? What is the point of baking and taking photos when there is so much else to be done? These days when everything feels so contradictory, when joy is followed by guilt, when frustration is followed by hopelessness, I'm trying to accept the dualism that will be here for longer than is comfortable. So, I will protest and then bake up a storm. I will despair over the news and then laugh with Elena. I will take action and then remember to take care of myself. At least, this is my goal. I've been testing variations of these chocolate molten lava cakes over the last weeks, which has been the perfect distraction when I need to take a moment off from the political world. I keep coming back to the recipe I originally developed for Sunshine Dairy, with a few adjustments especially with the technique. I found it's quite important to fold the chocolate into the egg mixture in a way that doesn't lose the air generated from the whisking. Watch the cakes carefully around the 8-minute mark so they don't bake through. Getting the cake to be truly molten, with chocolate oozing out the middle, is key. Heat oven to 425°F. Butter and dust 4 ramekins with cocoa. Tap out the excess cocoa and let set in the refrigerator for 30 minutes. In a small saucepan, bring 2 cups of water to a simmer. Place a small bowl over the saucepan, making sure that it doesn't touch the water, and melt the chocolate and butter together with the drinking chocolate, stirring frequently until smooth. Let cool slightly. In a medium bowl, vigorously beat the eggs together with the egg yolks, sugar, and salt until thickened and pale. Gently fold chocolate mixture into the egg mixture and then add the flour. Divide the batter evenly into the prepared ramekins and place on a baking sheet. Bake for 8-10 minutes, or until the sides of the cakes are set but the centers are wobbly. Let the cakes cool in the ramekins for 1 minute, then cover each with an inverted dessert plate. Carefully turn each one over, tapping the bottom and slowly lift up the ramekin. Serve warm with a light dusting of confectioners sugar. If you've been following along on Instagram, you've likely seen that Portland was covered in nearly a foot of snow for the last week. The Oregon governor declared a state of emergency, although less for Portland and more for the central Oregon region who received around 45 inches (114 cm) of snow. Crazy! It was incredibly picturesque, especially during the sunny days that followed the snowfall. With the temperatures remaining below freezing, however, it was icy and quite dangerous on the roads. Many small businesses, including myself, felt the disruption acutely. It was rough to fall behind, but I can't pretend I didn't love the wintery landscape and the extra time with my family - nine days! Yes, we drove each other a bit crazy at times, but we also had fun playing in the powdery snow, sledding, drinking endless cups of hot chocolate, and cooking up a storm in the kitchen. Marcus made bison jerky, dumplings, and cheesy marinara pasta. I made a chai spiced pear clafoutis, chocolate chip cookies, banana pancakes, and two loaves of honey bourbon banana bread. I was inspired by Food 52's bourbon brown butter recipe, which is delicious, but opted to substitute honey for refined sugar and a different take on dairy. Honey seemed like the perfect complement to Bull Run Distillery's straight bourbon whiskey full of warmth and vanilla. Fluffy and moist, rich with banana flavor and a hint of honey-laced bourbon, this recipe is exactly what's needed on these cold winter days. Heat oven to 325°F. Butter a 9-inch loaf pan and set aside. In a small mixing bowl, combine the flour, baking powder, baking soda, and salt. Set aside. In a large mixing bowl, beat the eggs and butter together, then slowly whisk in the honey, milk, sour cream, vanilla extract, bourbon, and mashed bananas. Slowly add the dry ingredients until well combined and fold in walnuts. Pour into prepared loaf pan and bake for 50 to 55 minutes or until a toothpick inserted in the center comes out clean. 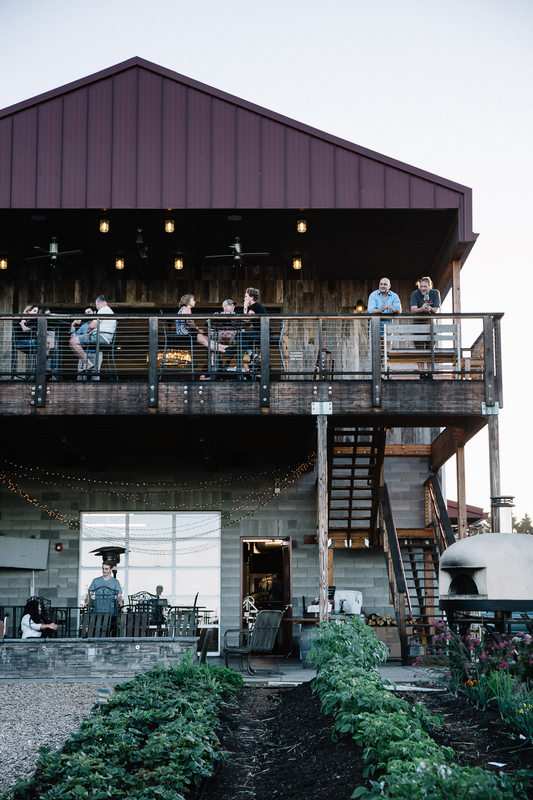 This post was created in partnership with the lovely crew at Bull Run Distillery whose spirits are a taste of Oregon in all its wild complexity.